A ceremony was held in Hanoi on June 9 to honor 100 outstanding blood donors from 63 cities and provinces nationwide. 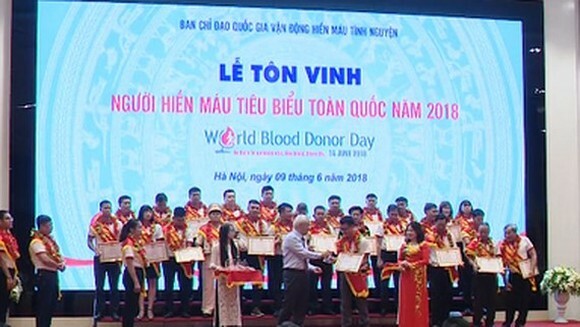 Vietnamese Ministry of Health (MoH), the Vietnam Red Cross Society, the National Institute of Hematology and Blood Transfusion and the National Steering Committee for Voluntary Blood Donation jointly held the ceremony to honor outstanding blood donors. Of these donors, Ho Van Truc from the southern province of Dong Nai who has donated his blood for 63 times and encouraged 1,800 others to give their blood. Other outstanding donors are Nguyen Ngoc Thanh, Pham Thien Hien, Nguyen Dinh Tien in Ho Chi Minh City who were honored for donating their blood for 63 times and their efforts in encouraging up to 2,000 others to join blood donation. Speaking at the ceremony, Vice Chairman of the National Assembly Uong Chu Luu praised blood donors stressing that they are seeds for the blood donation program. He called for all citizens, and soldiers should give their blood to save people and increase information of the blood donation program. President of the Vietnam Red Cross Society and head of the Standing Board of the National Steering Committee for Voluntary Blood Donation Nguyen Thi Xuan Thu said that the blood donation movement has gained encouraging achievement contributing to improve people’s health condition. From 2008 to 2017, the nation has received more than 9.2 million units of blood. There has been gradual increase in the number of blood donors. For instance, in 2008, the rate blood donors is 0.6 percent; however, it surges to nearly 1.6 percent in 2017. Especially, the blood unit of voluntary donors leaped from 70 percent in 2008 to over 98 percent in 2017. The donated blood amount has saved lives of millions of patients.